« Maurice Zouary plans new book about Lee de Forest, Ph.D.
On May 16, I sent some RCA members a message that included information regarding a book about Lee de Forest, Ph.D., that Maurice Zouary wrote. I mentioned that he is rewriting the book in hopes of widening its appeal and attracting interest from Hollywood to make a movie based on the work. See my blog entry about Maurice’s book, just before this one. Roger maintains at least nine websites that I could find. 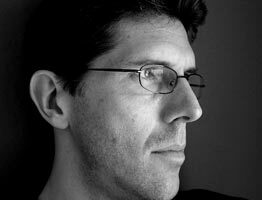 Aside from an interest in his celebrated relative, Roger has interests in making films, writing science fiction, and photography. 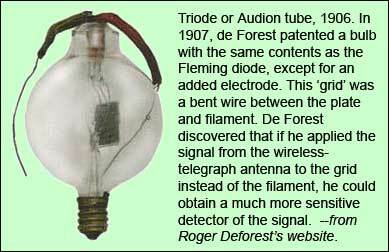 One of Roger’s websites is devoted to radio equipment manufactured by Dr. de Forest’s companies: www.DeForestRadio.com. I asked Roger for a telephone interview, but he instead offered an email interview. I sent him a list of questions to which he responded. Because I raised the subject of Dr. de Forest in the recent message, I’m thinking that the interview is timely … uh, timely for the subject, but not so timely regarding when the interview was conducted. January 2006, after all. Dr. de Forest was not an RCA member. In fact, he headed rival organizations. He served as president of the Society of Wireless Telegraph Engineers (SWTE), a radio communications society that was founded two years before RCA. Yes, RCA is not the world’s first radio communications society, but it may be the oldest one in continuous existence. Later, Dr. de Forest was president of the Institute of Radio Engineers, a society formed in 1912 that soon thereafter surpassed RCA in its size and scope, which was international. By the way, SWTE’s founder, John Stone Stone, became an honorary member of RCA in 1925. Because the DeForest Pioneers merged with RCA, RCA has a lasting connection with Dr. de Forest. With that as a background, let’s hear from Roger Deforest. Why did you put the site together? I put together www.DeForestRadio.com because I found a great lack of information for de Forest’s radios on the Internet. There is plenty of information on his life, especially the Audion tube and the Phonofilm process, but not so much on his radios. Months before starting the site, I would periodically search for de Forest’s radios on eBay and other auction sites, just to see if I could find a good deal. I have yet to find a good deal, but one day it hit me that I should put together a website listing all of his radios, with images and any other information I could conjure up. The only site that had detailed listings of his radios was one that showed old schematic diagrams. I thought that was great, but the average person is not all that interested in schematics. They want pictures of the radios, model numbers, year of manufacture, dimensions, etc. Most people who email me about the radios are not necessarily collectors of radios, but they had inherited or found a de Forest radio that they want information on, either to help sell or just for their own personal knowledge. Where did you find those wonderful photographs? Most of the photographs come from eBay auctions. Every month or so I scour that auction site and others looking for de Forest radio models that aren’t on my site yet. Some models are not identified, and I list them on the site as “unknown” in hopes that someone would be able to identify them. Some other photographs come from various antique radio sites. I do not own any de Forest radios, and am not a radio collector, but having this site has opened my eyes to some nice radios I may purchase someday. What did you consider putting in the site that you wanted but couldn’t find? I’m thinking of putting together a list of de Forest tubes, since those are highly collectible. The page would look the same as the radio list, with images and descriptions. 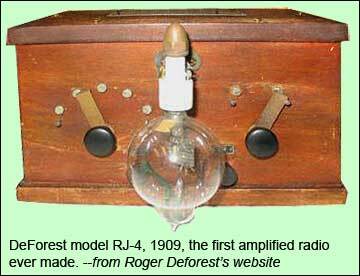 As far as the radios go, I would post any radio or any other de Forest device I could find. Come to think of it, I do own some of his test equipment and training manuals, so maybe that should go on the site too. How did you decide what to include and what to exclude? Well, the only thing I’ve decided to exclude was de Forest’s biography, because I felt there were at least two other sites which offered that magnificently. The closest thing I have to a biography is the timeline, which I like because it’s quick information and gives me the general idea of de Forest’s professional and personal life. I’ve been meaning to add more information to the timeline, I just haven’t gotten around to it. Oh yeah, I also had a forum in the early stages of the site, but got rid of it because not many people were using it and I had to switch hosts. But I’m thinking of adding it back on there. How are you promoting the site? I’m on all the major search engines and also linked to Wikipedia. I may be linked to other de Forest sites, I don’t know. I also run about a dozen other sites, so I link them all together as one big network. I get some visitors that way. I find that it takes at least a year before any real traffic starts coming around. My de Forest site has taken off quite well in a short amount of time. It seems I really hit on something here, and it’s a labor of love, so I am happy. Who do you want to attract to the site? I want to attract radio collectors, but more importantly I want to attract the average person who simply wants more information on their de Forest radio. I admit I wish I had more radio information to offer on the site, but I just have not found the right resources yet to put it all together. I’m looking for a printed catalog of de Forest’s radios (if it exists) so I can use that as reference. But I don’t know if I’ll have much luck. 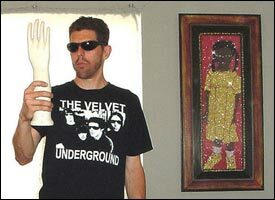 That’s mainly why I started the site anyway, to catalog his radios. What features would you like add to the site, or is it mostly complete the way you have it? 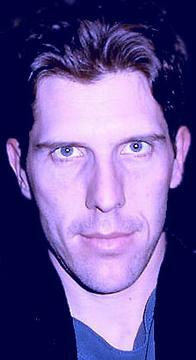 What I really want to put on the site are some of de Forest’s own personal writings on his work or his personal life. The gentleman who runs www.leedeforest.org is in possession of various de Forest material, but he says the documents are not organized or cataloged. I’m tempted to make the trip to his residence and help him sort out the papers and hopefully photocopy some for my website. Basically, I’m looking to make available to my visitors anything they can’t find at the other de Forest sites. I also want to archive it for my own personal reasons, so my son can know the history of this important relative. You describe yourself as a distant relative of Dr. de Forest. What is your exact relationship? Can you direct me to any other of his relatives? I notice you work in the film industry in some fashion (forgive me for not knowing exactly), and Dr. de Forest is known for his development of sound on film. In what ways does your current work have a connection or relationship with Dr. de Forest’s own work? Ha, you picked up on that, eh? I am a grip and lighting technician for commercials, music videos, independent films, etc. I’ve also done my fair share of audio, directing, and a little acting. But I would hesitate to say there is any connection with my interest in film-making and de Forest’s film work. I admit though that when I became serious about getting into the film industry, I started using Deforest as my last name to help open doors, but no one really got it. De Forest is a rather obscure figure outside of radio collectors. No one really knows who he is, and when I tell them they either don’t believe me or just shrug. My interest in film is waning though. Currently, my interests lie in writing science fiction, and I hope the next time you interview me will be as a great sci-fi author and not just some guy with a website! Have you learned all you care to learn about Dr. de Forest? To what extent, if any, would you like to hear from others who have an interest in him? No, I have not learned enough yet. In fact, I think I have just scratched the surface. Putting together my site has helped me in that regard. I also learned a lot about him from a great book called “Lee de Forest and the Fatherhood of Radio.” It not only presents his work in electronics, but also his religious beliefs, various marriages, and private concerns. That is a wonderful book to read if one wishes to know about de Forest the man, not just the radio pioneer. I do like to hear from other de Forest fans, and usually they ask me questions about him that I wish I could answer. I remember recently my dad and I went into a shop that sold old radio tubes, and my dad somehow got around to telling the owner we were relatives of de Forest. Well, the owner’s face just lit up like he was meeting royalty or something! He was very excited and curious, and asked us a lot of questions about de Forest, some of which we just couldn’t answer. On one hand, I like meeting de Forest collectors because I feel in a way it is a piece of my own past that they find interesting, and that makes me feel really good and proud. But then I do get upset with myself because I can not offer them anything beyond what they already know about de Forest. Unfortunately, I am not a radio collector and I don’t have any family anecdotes to share, because de Forest was not discussed much when I was growing up except that he helped invent radio. I’m hoping my son will grow up differently than I did, knowing more about de Forest’s contribution to the world and feeling proud about it. My thanks to Roger for the interview. This entry was posted on Wednesday, May 23rd, 2007 at 6:11 pm and is filed under Other stuff. You can follow any responses to this entry through the RSS 2.0 feed. You can leave a response, or trackback from your own site.